The Bee's Knees is a fun and very easy cocktail from the Prohibition era. Some stories claim that the drink was concocted because the honey masked the odor of the liquor. While that may be the case, one has to wonder if it really did the trick given some of the stories about the often pungent bathtub gins circulating during that time. 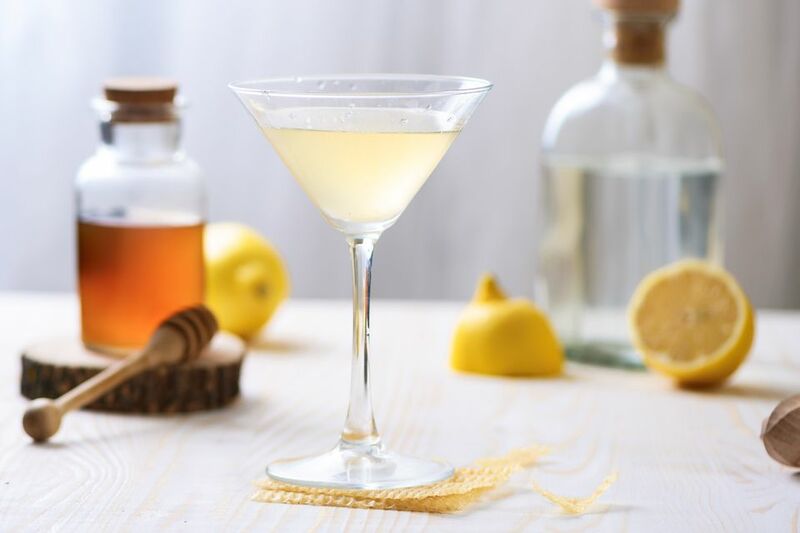 None the less, with today's variety of gins, the Bee's Knees is a delightful cocktail that you can experiment with. A London dry gin will create a completely different profile than one of the new American-style gins. Each gin has their own blend of botanicals that will be accented quite nicely with the lemon and honey, so it's a different experience with every drink. Every bar and restaurant will put their own spin on a great cocktail like the Bee's Knees. It's such a simple recipe that affords itself to some experimentation. For example, Hard Rock International has their bartenders shake up 2 ounces Hendrick's Gin, 1 1/2 ounce sweet and sour, and 1-ounce honey syrup. They also garnish it with a lemon wedge. It's a fun twist on the original that is perfect for many of the less-traditional gins. You will notice that these two recipes invert the sweet and sour ingredients. The first uses more sweetener and less juice while the second concentrates on the sour. There are two reasons for this. The first is that each recipe was adapted to the style of gin used. A traditional London dry gin with the juniper-forward flavor profile is best with a little less citrus. The Hard Rock's version opts for the softer profile of the cucumber-forward Hendrick's, which can take a little more tartness. The other reason lies with the sour ingredient itself. Sour mix (aka sweet and sour) is a citrus-based simple syrup, so it naturally has some sweetness to it that plays down the tartness of the citrus. This makes the honey syrup less critical for obtaining a well-balanced drink. Keep these two factors in mind as you play around with the Bee's Knees. It's likely that each new gin you introduce will require a little more or a little less of either ingredient. How Strong Is the Bee's Knees? As with many classic cocktails, the Bee's Knees is not a very light drink. It has a high concentration of alcohol and the syrup and juice do little to tame it down. However, it is a full-flavored drink and comes in about average for this style with an alcohol content around 21 percent ABV (42 proof).